Tonight my spouse called a local pizza place for our usual Friday night pizza. Of course we live too far out for delivery so he headed out the door to go pick it up. Suddenly, surprisingly, it struck me that there was no reason for me not to go too. Lately I am always needed at the house to do something or to be asked about something that needs doing. Tonight I was free. When we headed out it was surprising to me to see all the trees in bloom. That non-flowering trees had leaves was even more surprising. We mulled over how long it was since I left the house and finally pinpointed it at exactly two weeks. At this time of year two weeks is a horticultural millennium. 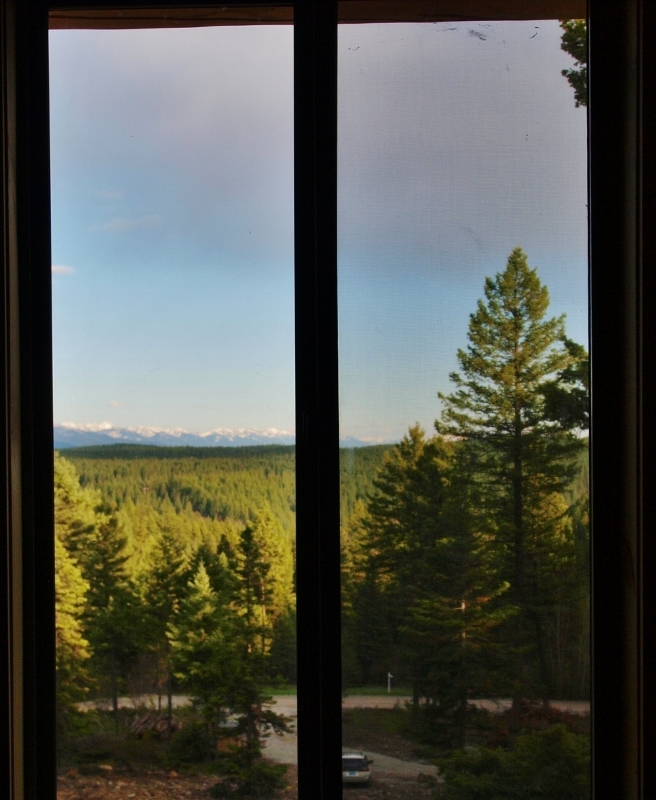 As I gaze out my window to the world evergreens fill the horizon until it is overtaken by high snow capped peaks. Our house is surrounded by evergreens and low brush like blueberries and other shrubs. It had not crossed my mind what was happening higher than three feet above the ground in the vegetation department. I am so enthralled by what is going between 3 feet and 1 inch high on our property that I don’t need to look higher to be kept very busy. Each day I notice something else that makes its way out of the dark earth to spend the summer reveling in the sun. For a long time it was the little tiny green moss patches that were the most entrancing. 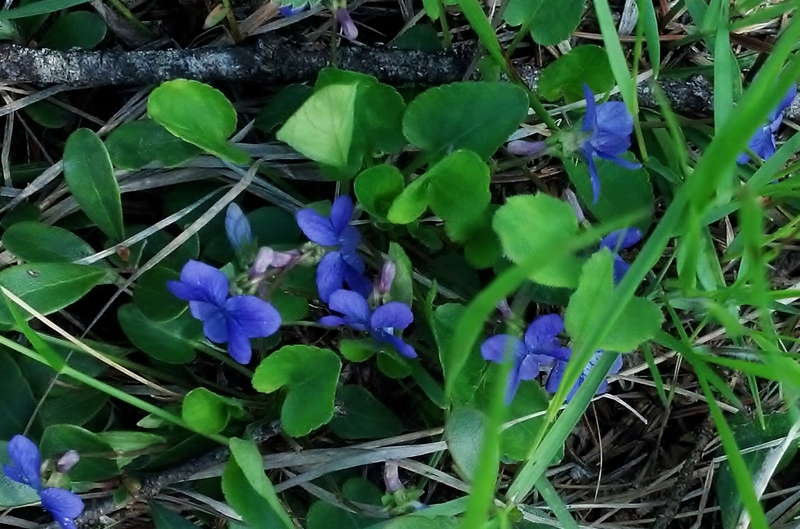 Two days after my last trip to town, I found violets embedded in taller grass that was mixed winter mat and new green leaves. Something about it was shocking to me. I don’t know what but I remember feeling surprised like having been given a small gift by someone you care about. I stood thinking to myself trying to figure out why I was surprised by the violets, it was spring after all. I went on inside and did not think about it again until today. I had other encounters the past couple of weeks with growing things. I found wild strawberries in the grass down by the road. There are blueberry bushes everywhere. Some are tiny, just a few twigs and half a dozen leaves. Others are knee high and already branching out preparing to bud and bring forth berries that I can put up for the winter if I get to them before the bears do. Today I noticed mules ears (Wyethia mollis) had sprung up in half a dozen places. Last week Indian Paintbrush (Castilleja Indivisa) made its way into bloom. The flowers on the front of the house on the ravine side are orange. The flowers on the back of the house on the side that rises up are pink. I spotted false soloman’s seal plants (Maianthemum racemosum) although they are not yet blooming. I love wildflowers and when I was young learned to identify hundreds of them. Most of them were Southern Appalachian Mountain plants as that was where I grew up. Surprisingly, here in this wet corner of Northwest Montana a lot of the same flowers grow. One of the highlights of hiking to me is the wildflowers. I am always happy when my spouse wants to go hiking and fishing because it means he will stop long enough for me to wander around and find all the wildflowers. Sometimes people are shocked that when we go “fishing” he has a hook in the water and I am locked to the land looking for flowers. I am so taken by what is three feet and shorter in my yard because my yard is like where we go hiking. It is filled with the flowers I go to see. My own land, without my help, is bringing forth the kind of garden I came here to grow. One of the reasons we picked this location is its regular moisture and warm but not hot weather. I have been struggling to garden in the desert for years and before that had gardens in Alaska where we used to live I grew nasturtiums the size of dinner plates but for a very short time. We had a 60 to 70 day growing season. Here I have a 100 or more day growing season and I have rain and sun both. I have not yet decided where to put my vegetable garden but I know it will have a fence. Between the deer and the bears we would have no food left if I did not have a fence. Lower in the yard, where the deer pass normally I will plant native grass and wildflowers so that the deer have some natural browse that might keep them entertained far from my gardens. Regardless of how my gardens will grow, the wildflowers and native plants that established themselves here long before I cam will be the stars of the garden. No matter how many times I look at them they will be beautiful to me. I know to look next spring for the return of the violets. I will look forward to the pink-in-back, orange-in-front Indian Paintbrush. I will look for the Salomon’s Seal to bloom. There are other bushes and plants that I don’t know but will learn. I will have time to do that. I will be free to visit the ground from one inch to three feet to see what I can see. There are plants that will bloom later that will surprise me then. I am looking forward to being surprised.